ANDREA NORTH "SKYLINE" TOWERS Why Purchase a unit in Andrea? Superior Location The advantages of your central location is impressive. With its strategic location, you would be able to enjoy the comforts of living within the vicinity near topnotch educational institutions, medical centers, Ortigas CBD, Quezon City CBD, Makati CBD and other commercial establishments. It is also accessible thru various public transport facilities and LRT - 2 line. Plus! Situated at one of the Highest points of New Manila, you can be assured to be flood free and have a breathtaking view of the Metropolis.
" Located at EDSA corner Pioneer Street in Mandaluyong City and very accessible from MRT Boni Station this landmark is an ideal investment with a guaranteed high income with the possibilities of high return and profit. 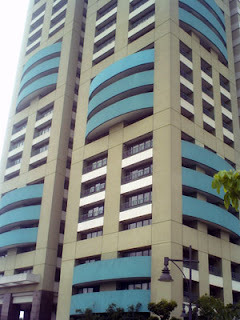 For the end users the concept of "safe and secure" condominium living is a reality". 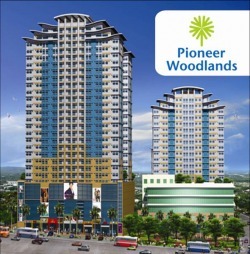 Pioneer Woodlands will consists of 7 Towers when fully completed at present Tower 3 is now open for sale while Tower 1 & 2 were all sold out and on the fast track of construction. Its developer is Empire East Land Holdings Inc.